It is fitting, then, that when Wizards decided to pin the Return to Ravnica Event Decks to two of the guilds, Rakdos was one of the two selected. Aggression has been a mainstay of the Event Decks product line since the very beginning, with the mono-Red Into the Breach from Mirrodin Besieged. With this being the first time that both Event Decks from a set are two-coloured, it was important to find a way to give them some differentiation in terms of tactics, while accomplishing the same overall objective- win Constructed matches with a limited quota of rare cards. A look at the deck’s construction reveals it to be cut from much the same cloth as some of its mono-coloured predecessors such as Hold the Line, frontloaded with a raft of cheap and aggressive creature options and backed up by abundant removal. There’s little gimmickry here, little tactical finesse other than to flood the board and blast your way through to victory. That isn’t to say that the deck requires no strategy- on the contrary, the archetype is often more nuanced than its detractors give it credit for. But given the shape of the deck, one of the earliest choices you’ll have to make- whether or not to unleash your creatures- is all but made for you. 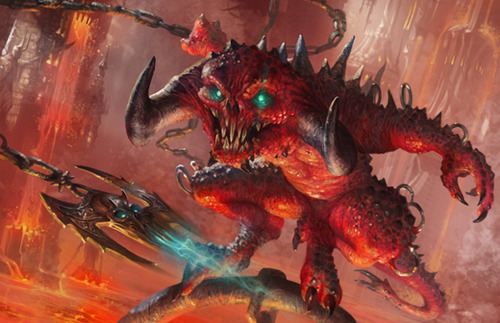 We open with a full playset of Rakdos Cacklers, 1/1 Devils with unleash. Like the other cards in the deck with this mechanic, it will almost always be the correct play to give them the extra +1/+1 counter, since the number of games you win through raw aggression will be greater than the ones you win through having some semblance of defense. From there we find the first two of the deck’s seven rares in the Stromkirk Noble. For a time, the Noble was a card in high demand, though prices have fallen over time as decks have moved on. Although the Event Decks aren’t quite as bad as state fairs for employing the once-mighty entertainers of yesteryear, it is truism that they make a great ‘last tango’ type of showcase for just these types of cards. Those expecting current chase cards like the reprinted dual lands cycle are only setting themselves up for disappointment, as including chase rares at the bleeding edge of their legality cannibalises the demand for packs. We’re not sure we’d categorise the Noble as “washed-up,” but so long as the deck performs, what does it matter? The final card here is the Stonewright, an inclusion from Avacyn Restored. Featuring the soulbond mechanic, this Shaman gives itself and its partner Firebreathing when bonded. Having a way to turn all of your excess mana straight into damage is quite useful here, as the deck is so tightly-wound and frount-loaded, with every land drop a thing not to be wasted. Moving on to the two-drops, we find a couple of the usual suspects with the Rakdos Shred-Freak and Rix Maadi Guildmage. The Shred-Freak is an instant staple of the guild, being a 2/1 with haste. Naturally, you get a full playset here and they’re just the thing to keep rolling off the assembly line. The Guildmage, on the other hand, is a bit more of a reactive card. Both of its abilities are both cheap and useful, but they allow your opponent to dictate the course of play so some degree. Still, there’s a wonderful synergy between them that effectively says, damned if you do, and damned if you don’t when it comes to blocking. Both are solid inclusions. Another soulbond creature pops up here in the form of the Lightning Mauler. The mauler is comparable to the Shred-Freak in that they are both 2/1’s with the potential to attack the turn they’re played. For the Shred-Freak, this is a certainty, but it’s ability is confined to itself alone. For the Mauler, it has the ability to confer the ability to both itself and another, but this is offset by the conditionality. If the Mauler is the first creature you play, it will be sitting idle for a turn. This makes for an interesting contrast between both cards and design. Finally, there’s a trio of the Knight of Infamy from Magic 2013. This is a card that’s drawn a few unflattering remarks, and it’s true that at first blush it doesn’t seem like an ideal fit in a swarm deck that relies on sending a gaggle of misfits and sadists across the table to thump your opponent in the noggin, but it does exert an influence on the early game by helping you to stay one step in front of your opponent in the crucial early game. For instance, if you play an unleashed Rakdos Cackler on your opening turn, then follow with the Knight of Infamy, you’re swinging with a 3/3 on turn 2. That should be more than sufficient to overcome most obstacles your opponent tries to throw at you, though Call of the Conclave shows that this isn’t a foolproof tactic. Finally, we come to the top of the deck’s mana curve at the three-drop slot. Here we find another unleash creature in the Hellhole Flailer. A solid body that also can send some damage across the table at your opponent, the Flailer is a solid choice to anchor the top of the deck. In a deck packed with burn, being able to get in that much more damage can be the difference between winning and losing in a deck that throws away long-term planning in return for quick and aggressive power. The burn suite backing up Wrack and Rage is amongst the strongest we’ve yet seen in a preconstructed deck. You have little burn, big burn, and burn that’s just right. In fact, there’s almost nothing else in the support suite besides direct damage, and it’s a glorious thing. First up is a full playset of Pillar of Flame. From Avacyn Restored, this card is the perfect example of cross-block design. In Innistrad, this was great against the pesky undying creatures that bounced back from the graveyard bigger than ever before. In Return to Ravnica, however, it’s just the ticket against the Golgari and their scavenge mechanic. Although not as quick as Shock as it’s a sorcery, it’s a very good card all the same. Next we find a playset of Searing Spear, the latest version of a ‘fixed’ Lightning Bolt, an ideal card for keeping the red zone lanes clear so that your more efficient creatures can keep whittling in for damage. You also find a pair of Brimstone Volleys, a Lightning Bolt variant from Innistrad that uses the morbid keyword to increase your damage output. They cost one more than the Spears, but in a deck as aggressive as this one you’ll not be waiting long for something to die. For broader output, we find a copy of Devil’s Play as the deck’s lone X-spell. Although it’s not cheap to do so, the card’s flashback makes it another useful end-game option when the combat zone has stalled out and you’re desperate to push through those last few points of damage. Finally, there’s a Return to Ravnica rare card in Mizzium Mortars, a well-balanced offering that lets you blast one target for four damage, or pay a bit more to overload it and rain fire down on your opponent’s side of the table. Although you wouldn’t classify it as burn, the Rakdos Charm has a damage-dealing mode, though it impacts you as well. It’s a superb option for playing against an opponent who’s managed to stabilise the board through overwhelming numerical advantage like the Selesnya. There’s also an anti-graveyard mode as well as a fallback Shatter option. Finally, a singleton Nightbird’s Clutches is another way to break through a board stall and get in a bit more damage from your army. The deck’s strategy insert itself advises that you won’t be doing much in the way of sideboarding, since the deck is fairly tightly built as it is. Still, since you never know what you’re going to come up across there are a few options for you to explore. There’s some additional burn and removal options that you can tailor to what your opponent is playing. Against a swarm of weenies you’ve got recourse to Electrickery, while fat creatures outside the effective range of your burn can be dispatched with Murder and Ultimate Price. There’s some additional Brimstone Volleys if you’re facing a foe that has removal of their own, letting you take advantage of the high mortality rate to blast away for 5. 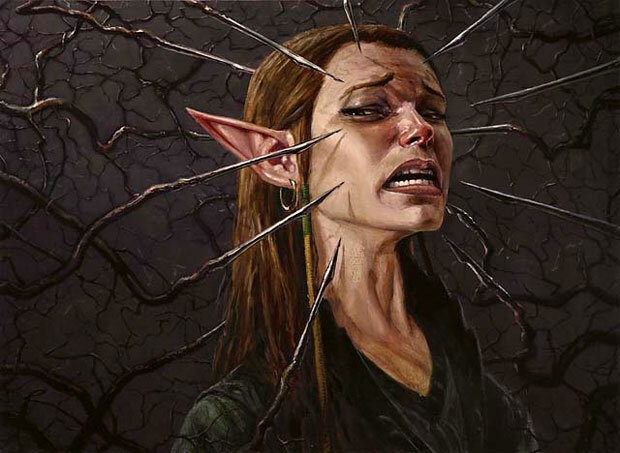 A singleton Grafdigger’s Cage helps put a lid on graveyard-based shenanigans like flashback, while Duress can pluck planeswalkers and other substantial threats out of your opponent’s hands before they have a chance to deploy them. Faithless Looting gives you the ability to sift through your library if you find some of your cards aren’t as effective as you’d need them to be against a particular opponent’s strategy, and o, hai, Vexing Devil. For nonbasic lands, we find a Dragonskull Summit and pair of Rakdos Guildgates, the latter probably a touch slow for the needs of the deck but at common almost inevitable. And there you have it! Check back in two days as we take the Golgari deck Creep and Conquer into battle to see how it holds up before issuing a final grade. See you then! IDK if I just didn’t look to closely my first peak at this deck or you did a great job talking about it, but I REALLY like this deck now. I’m seeing a lot of synergy between cards(stonewright + hellhole flailer) and overall this deck is really well built. 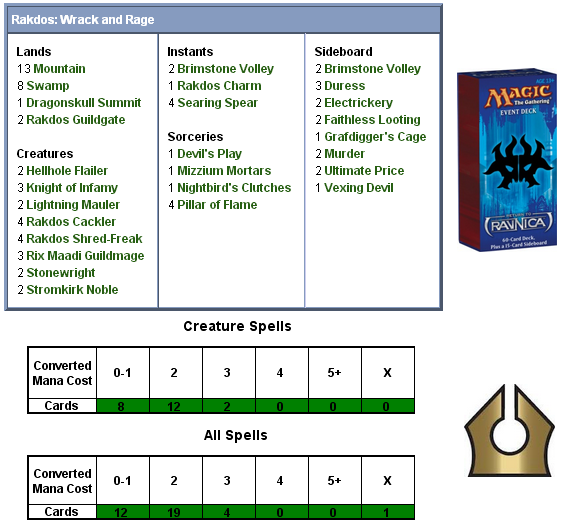 I’m not looking at canibalizing this deck, but this may be a deck I pick up and never adjust it.